Home Opinions	Is Concordia’s dormitory policy dated? Is Concordia’s dormitory policy dated? The adjustment to university residence life can be tough. Gone are the days of home-cooked meals and Mom taking care of your laundry. Rutgers University is hoping a change in their housing policy will put all students at ease as they settle into their new environment. Beginning in the fall semester, some students will be able to select either a male or female roommate. The decision was reached following the suicide of freshman Tyler Clementi, who jumped off the George Washington Bridge after his roommate secretly streamed a video of Clementi in a sexual encounter with another man. Rutgers now joins a growing list of universities offering gender neutral housing options. But could this policy also work for Concordia residences? According to Rich SwamiNathan, the manager of Res Life at Loyola, the idea has never been discussed at Concordia because there have not been any requests for it. “It could happen â€” we’ll just have to wait and see,” said SwamiNathan. Currently at Concordia, students can choose between living alone or with a roommate. However, rent is higher for a single room than it is for a double so students may be limited in their choice because of financial reasons. “If someone has an issue [with a roommate] during the year â€” we would solve it,” said SwamiNathan. 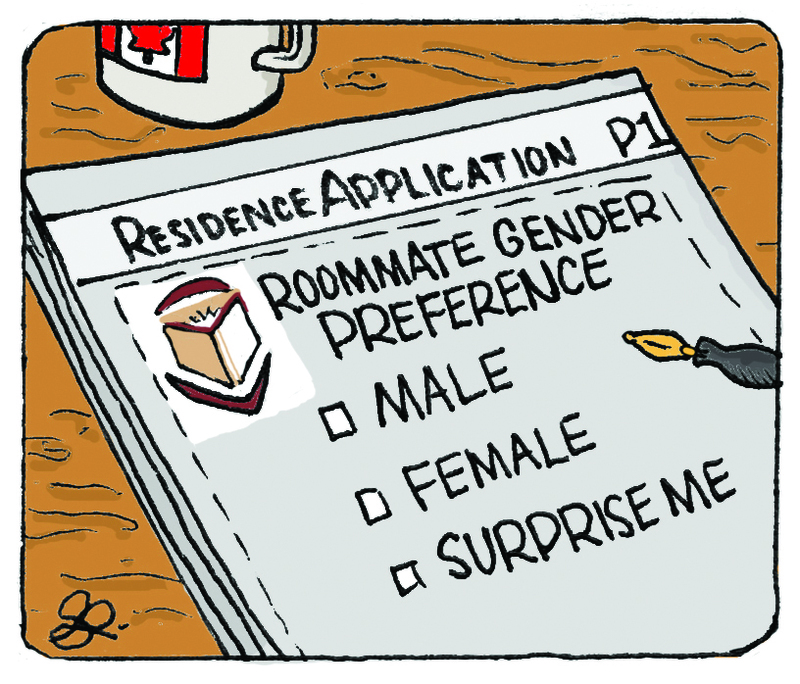 The residence application includes a brief questionnaire of one’s personal habits but it does not ask about sexual orientation â€” doing so is against Concordia’s policy. The actual pairing of roommates is done through a computer program. Due to the Freedom of Information and Protection of Privacy Act, residence life is not permitted to share any personal information about one’s assigned roommate prior to move-in day. In the United States, where this act does not exist, many students choose their own roommate(s) after meeting them at orientation or talking over Facebook. Putting this important choice into the hands of students, rather than computers, seems to be a smarter alternative. Concordia residences are relatively small: last fall, 600 people applied to fill 424 available spaces. But it’s this close-knit, community atmosphere that makes students feel right at home. “One of the benefits of having a small residence life program is that our residents receive individual attention as opposed to sweeping policies,” said resident assistant Cameron Monagle. Choosing your own roommate might not currently be an option at Concordia, but with a little persistence, students seeking equality have the potential to change these dated rules.